Do you have a method that you use to study the Bible? I refer to this as my “quiet time”. Moments that I have set aside to have uninterrupted time in the Bible. Time alone with the Lord to be still and know that He is God. 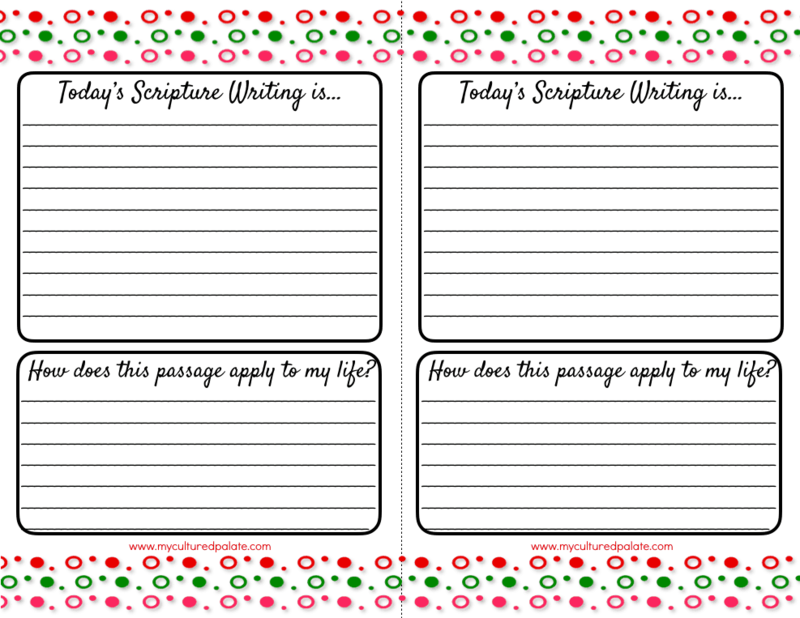 Scripture Writing has become an exciting part of this time! Yep, you have her to thank for this! My sister told me about scripture writing and I am totally excited about it. If you haven’t heard of it yet, just like the name says, you write scripture verses each day. It is very easy – no complicated instructions here! 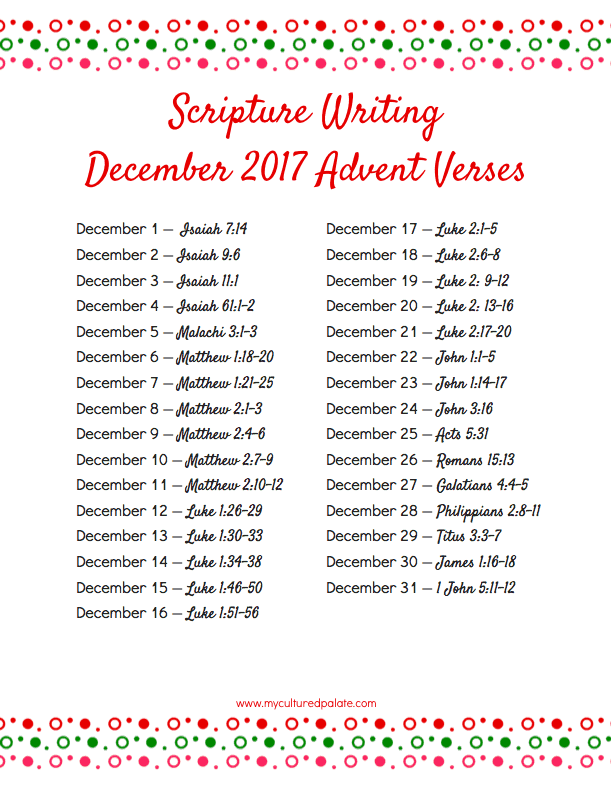 Scripture Writing Advent Verses – these are the verses for the month of December. 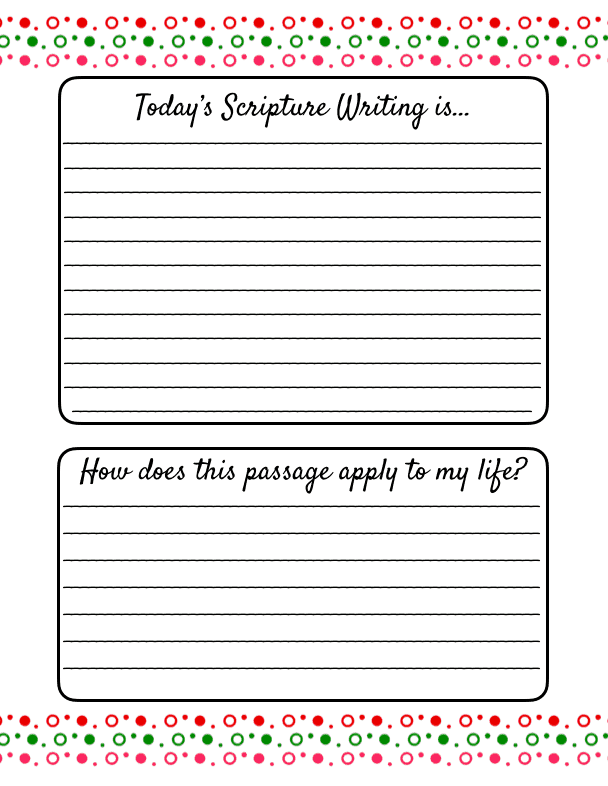 Lined Pages print a full page to use for writing your verses on. Lined Pages for writing verses – half page. This prints two to a page so you can cut them in half and use in a smaller 3 ring binder notebook. You can see the small notebook I use here. Scripture writing is just as the name suggests – you write scripture verses each day. 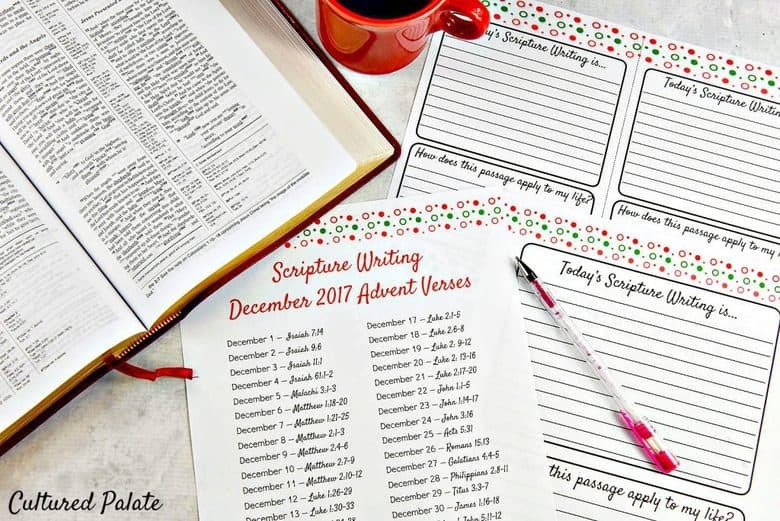 You can use a notebook, a journal, or you can print the lined pages that go along with the Scripture Writing Advent printable. There is also a question at the bottom about how to apply the verses to your life. Write, meditate, pray through the verses. Then be sure to journal your thoughts, what you learn or what impressed you through the passage. You can spend as long or as short an amount of time as you have. The goal is to get in the Word! The verses for this month were selected to remind us of the true meaning of Christmas. I cannot tell you how blessed I was as I went through the Bible, picking verses to use for the printable. There are so many and it just plain blessed my socks off getting it ready to share with you! How Long Does Scripture Writing Take? Each day takes no longer than 10 minutes – but you can spend as long as you want on them. As a busy woman/mom, I know it can be so difficult to find the time to get alone with God and His word. Scripture writing is designed to get you into the scripture for a few minutes, giving you a chance to let a verse or two (or three) find their way into your heart so the Spirit of God can minister to you as you go throughout your day. Since our youngest is now 9 yrs old, I have more time than I used to have. But, I remember feeling like I was the queen of rocket praying. You know, the quick prayers you shoot up as you do dishes or are changing diapers. It is amazing how just a few minutes like rocket praying can make such a difference in attitude. The same is true for anytime spent is scripture! It is completely up to you when you do your scripture writing. For me, I find that early morning is the best time. Even before everyone else is awake. The house is quiet and I am not distracted. That also means, that I have to get to bed at a descent hour the night before – I’m working on this one! 1. It gets you in God’s Word. The obvious benefit of scripture writing is that you are in God’s Word. Do you have a regular quiet time but sometimes just feel as though you are just going through the motions to check it off? I know I do! With scripture writing, the time commitment is very small – that makes it manageable. If we are honest, who doesn’t have 10 minutes that could be used writing scripture? But, don’t be fooled. Even 10 minutes in the Bible can equip you mightily as you go about your daily routine. And, if you have longer, then by all means keep at it. It is amazing to me how one verse triggers another and another! By actually writing the passage of the day you are using more of your senses which engages your mind (and hopefully your heart) to a greater extent. The mechanics of writing has helped keep me focused. This means that I don’t finish reading, get up and wonder what I just read. I don’t know about you, but to memorize verses, I write them over and over. That is why I love scripture writing because it helps me memorize verses and I can say them to myself throughout the day. If you are into lettering, this is a great way to practice! Even children can use scripture as handwriting practice and older ones can learn something different too with new lettering methods. Grab a cup of coffee, snuggle up with your pen and paper – either a notebook or the lined paper included in the printable and let’s get started. Be sure to leave a comment and let me know your thoughts and experiences with scripture writing. I would love to pray for you throughout the month! 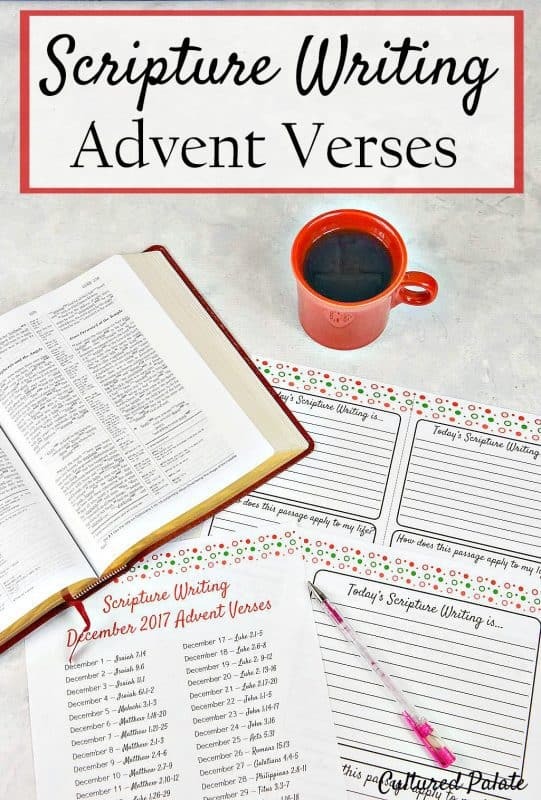 Each set contains 43 pages with different verses for each month’s theme. As a bonus, with each set, you also receive a Prayer List and two different Bible reading plans. I did a Bible study where we had to write scripture, but that has been years ago. When I saw your plan for reading the Bible, it was a reminder to me how I need to get back to not only reading God’s Word, but writing verses. Writing out God’s Word helps me to hide His Word in my heart. Thank you. Susie, I agree! There is just something about writing it down that helps keep in mind throughout the day! I Just found your website. I am just now hearing about scripture writing. In school (a long time ago!) I used to rewrite my notes to help me remember the material for a test. So, I think scripture writing may be exactly what I am looking for in 2018. I also just discovered bible journaling and want to somehow combine the two. In my mind they go well together. I plan to try and then blog about it. Basically I want a bible reading plan I will stick with year round not just the first few weeks in January and your scripture writing looks like it will be just the thing. Thank you for that. Be Blessed. Sheila, I am so glad and hope you enjoy it – let me know how it goes! It has really been a blessing to me! tHank you for this, it really helped, I’ll be sure to share my Scripture writing journey on my Blog. Thanks, Briony! I always love hearing that others are encouraged!